Home / Reviews / Fear The Walking Dead: The Complete Third Season Blu-ray Review! Fear The Walking Dead: The Complete Third Season Blu-ray Review! What was once the rage is now showing its age… I don’t mean to break forth the rhythm and the rhyme, but the zombie genre has been on a slow and steady decline. It happens with every white-hot genre property, see vampires, meta horror, etc…. Zombie films are no longer the rage and The Walking Dead has been on for almost nine years now. With the fan complaints about the mothership, it’s only fitting then that Fear The Walking Dead would be having its own set of issues. 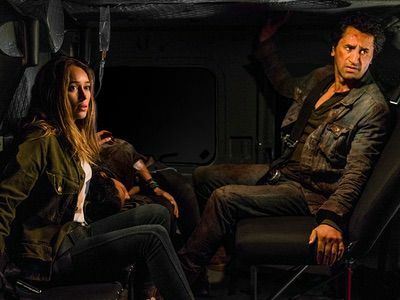 Fear The Walking Dead: The Complete Third Season has just been released on Blu-ray and to say the series is having trouble finding its footing is an understatement. What was a promising premise just hasn’t lived up to what it could be. There are times when the action and plot are spot on and really showcases the decaying moral center of humanity among a world that is literally decaying. However, these times are undercut by serious flaws. The team from Fear The Walking Dead are at the US and Mexico border and while the country lines are getting blurred, family lines are as well. Every shifting power struggles and the emotional toll of living in this new society trust characters like Nick (Frank Dillane) into becoming leaders. The first couple episodes are really strong and feature the rag tag group at a military base where some “soldiers” are doing experiments on walkers as well as humans. Very Day of the Dead and still frightening to say the least. 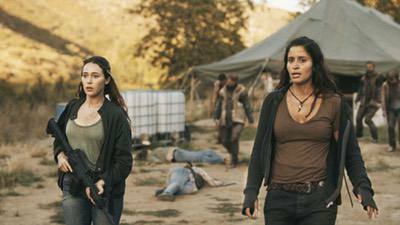 Then episode two features one of the most shocking moments in Fear the Walking Dead history. It’s a great moment and the cast is outstanding the episode. I’m not going to spoil it here, but it needs to seen if you’re a fan of the genre and series. From there however, it seems like the writers don’t know quite where to go. There are moments of inspiration that tend to get lost in the sea of bland generic bits. This is really unfortunate. Plus, unlike the original Walking Dead flagship, Fear has left the original cast intact (with some notable exceptions this season). The thing is, they really have never jelled or came together like the cast on The Walking Dead has. They’re more like ideas of people and not real living three dimensional characters. That’s the main flaw of the series and one that’s going to be tough to overcome. Fear the Walking Dead: The Complete Third Season arrives on Blu-ray in an excellent transfer. The fine details are present here and the picture quality is a leap ahead of the broadcast version. With the high definition really does is sell the landscapes and post-apocalyptic barren lands that punctuate the series. Plus, the walkers and the special effects detail look outstanding here. Deleted Scenes and extended scenes for episodes 301, 302, 303, 304, 305, 307, 311, 313, and 314. Audio commentary tracks for three episodes: Eye of the Beholder, Children of Wrath and Sleigh Ride. 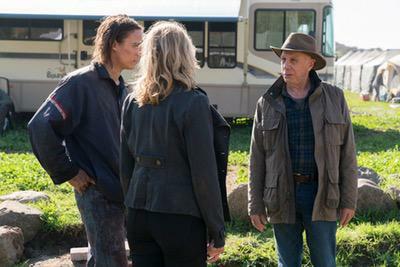 Overall, it’s tough to do a spinoff series and even harder to do one for one of the most beloved and highly rated shows in cable television history. While Fear the Walking Dead may never reach the heights of the flagship series, for fans of the genre its worth a look. Just make sure to note it’s not without its flaws. Fear the Walking Dead: The Complete Third Season is out now on Blu-ray! 21 And Over Blu-Ray DVD Review! Grab A Few Brews & Bros And Check Out The Flick Starring Skylar Astin! Justin Chon! And Miles Teller! 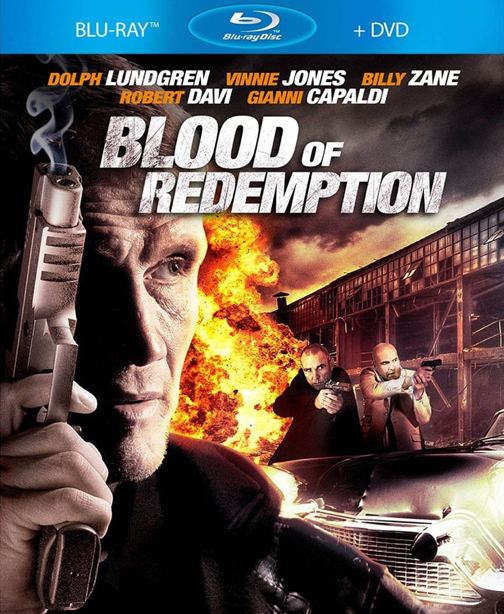 Blood Of Redemption Blu-Ray Review! Do Dolph Lundgren & Billy Zane Have What It Takes In this Action Thriller?